Predatory capitalism, renewable energy, and the fight against fracking, in an often humorous exploration of contemporary life in Atlantic Canada. A diaristic collage of entrepreneurship and environmentalism. 100 SHORT STORIES is the latest documentary from acclaimed Nova Scotian filmmaker Neal Livingston, and his first feature-length film. 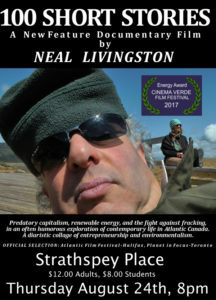 With his filmmakers typical irreverence, Livingston interweaves tales of predatory capitalism, eco-activism, and contemporary life in Atlantic Canada, engaging in an offbeat and often humorous exploration of energy policy, governance, and regional culture, in a diaristic collage of entrepreneurship and environmentalism. The film presents a first-person account of a years long struggle to develop Black River Wind a renewable energy project, and overcoming an attempted hostile takeover. Meanwhile, the local citizens of Inverness County band together to defeat oil and gas drilling and fracking coming onto Cape Breton Island. Local filmmaker Neal Livingston will be present to introduce the film and to do a Q&A after the showing. Neal Livingston is a filmmaker, director, and producer with a long filmmaking history who lives near Mabou, Cape Breton. His films have been broadcast extensively, primarily in Canada, and also in the UK, USA, and Australia. Many of his productions have been seen at festivals around the world where he has been an invited guest. Livingston makes political documentaries on environmental issues, and portraits of people and communities. Many of his films have humorous dimensions. 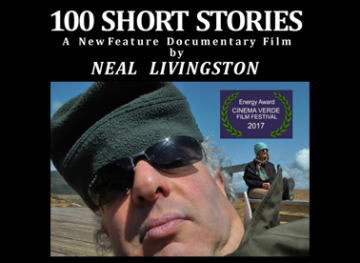 100 Short Stories (2016) is Livingston’s first documentary feature. Neal Livingston began making documentaries when he finished his BFA in film in 1976. Between 1978 and 1994 four of Neal‘s documentaries were screened at the Museum of Modern Art in New York City weekly film series. The films screened at the MOMA were Budworks, Water Power, Herbicide Trials, and Both Sides Of The Wire. Retrospectives of Livingston’s work were held at the Cinematheque Quebecoise in Montreal for 2 nights in 2001, and at the Confederation Centre of the Arts in Prince Edward Island in 1998. Two of Neal Livingston’s films, Michel in a Suête and Snow on the Lake were selected for screening in the Vancouver 2010 Cultural Olympiad Digital Edition during the winter Olympics. These films were the only one’s chosen from Eastern Canada for screening in the Cultural Olympiad.